Manchester based, with travel across the northwest of England. The role will usually be one day per week but flexible depending on candidate and project requirements. To apply, please email your completed application form to work@righttoremain.org.uk by midnight on Friday 22 March. The interview date for shortlisted applicants will be 4 April 2019. Please note we will only accept completed application forms, not CVs. We cannot consider applications that arrive after the closing date. We will send a standard acknowledgement of all application forms received, but will only individually contact short-listed candidates. Please note we are unfortunately unable to arrange work permits for people who do not already have the right to work in the UK. Detention is one of the most harmful aspects of the immigration system. Nearly 30,000 people are detained without time limit every year, in prison-like conditions, just because they don’t (yet) have the correct immigration papers. Tens of thousands more live with the threat of indefinite detention hanging over them, or with the trauma of past detention. Detention harms those detained, those at risk of detention, families, communities and our society as a whole. 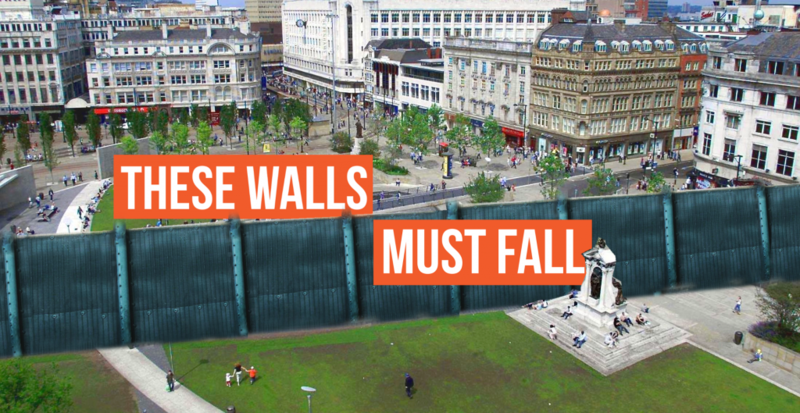 These Walls Must Fall (TWMF) is an initiative to build local campaigns to challenge the use of immigration detention in the UK. When you have these people, groups, organisations, communities, acting together, it all adds up to some serious people power. This is what it will take to convince the politicians that they must act to shut down the detention centres. This is what you will be supporting in the northwest of England. Right to Remain works with groups across the UK supporting migrants to establish their right to remain with dignity, safety and humanity, and to challenge injustice in the UK’s asylum and immigration system. Please read more about our work on our website. In addition to this new role, Right to Remain has four members of staff: two Right to Remain co-ordinators, and two part-time These Walls Must Fall organisers (northwest England; and south and west Yorkshire). Right to Remain is a not-for-profit company, limited by guarantee, governed by a management committee of volunteer company directors. Support the These Walls Must Fall organiser in the northwest to build and develop relationships with local organisations, institutions and influencers, particularly in BAME, migrant and faith communities. Support the organising and delivering of local and regional campaign actions and events. This will occasionally require working at evenings and weekends, for which time off in lieu will be given. Support people directly affected by immigration detention when attending public events. This will occasionally require working at evenings and weekends, for which time off in lieu will be given. Work alongside other local campaigners to plan and deliver awareness sessions on detention and the These Walls Must Fall campaign. Understanding of campaigning tools, techniques and strategies, and/or willingness to learn and develop skills in this area (the latter is essential). Experience of grassroots campaigning for change in either a paid or voluntary capacity. Experience of networked campaigning and/or community organising would be a particular asset. Existing contacts/involvement with local BAME, migrant and/or faith communities would be a particular asset. Any offer of employment will be subject to the satisfactory completion of a criminal convictions disclosure form, detailing any unspent convictions (via the Disclosure and Barring Service). The disclosure of convictions will not automatically lead to the withdrawal of an offer of employment as the relevance and timing of convictions will be considered. If you require more information, please request to see Right to Remain’s “Recruitment of Ex-Offenders” Policy.